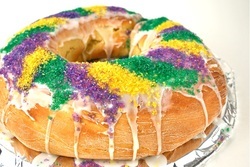 If you are lucky enough to get a "real" King Cake from New Orleans, you won't have to make one yourself or get one from your local bakery. A Pancake race is traditional in the UK. For us, it seems that a Tuesday school night is too difficult to really do anything. But, we still have to eat! So our family Mardi gras tradition has revolved around 2 meals that we always have on Fat Tuesday—Muffulettas and King Cake, and pancakes. Since we like both of these meals, we usually have both, but one is certainly enough.I always set the table with some flair of purple and green. We eat the pancakes for either breakfast or lunch.Traditionally, pancakes were eaten in abundance on Fat Tuesday so that the kitchens could be cleared of all butter, eggs, and milk since these were not eaten during Lent.We have our decadent pancakes with strawberries and whipped cream with sausage on the side. 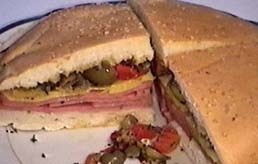 Invented in 1906 by Italian immigrant Lupo Salvadore, who opened his Central Grocery in downtown New Orleans, the muffuletta is a signature food of the Big Easy. During Mardi Gras season, the Central sells as many as 500 of these Frisbee-size treats. One serves a family of four. In a small bowl, stir all of the spread ingredients until they are well mixed. Slice the loaf in half and spread the top and bottom with mayonnaise. Layer on the olive spread, meat and cheese. Tightly wrap the sandwich in plastic and refrigerate for one hour. When you are ready to eat, slice the sandwich into wedges and serve. Mardi gras is a festive occasion. We try to play silly games or make silly crafts.It’s a good night for games like Pictionary and Charades.You can do odd things like eat breakfast for dinner or eat dessert first .Just pick one simple zany thing to do and if it goes well, establish it as your own family tradition. Your kids will remember it fondly! I promise.